The Brent Meta-Network (BMN) is a three year project funded by the Trust for London. The project was designed in response to feedback from local voluntary sector organisations who felt that there were insufficient representation structures for effective dialogue with decision-makers such as Brent Council and other statutory bodies. 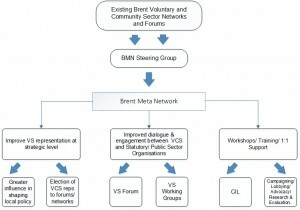 To bring together all voluntary & community sector (VCS) led forums/networks by serving as a single point of contact for dialogue and engagement between Brent’s VCS and local statutory agencies including Brent Council, Brent Clinical Commissioning Group and other community stakeholders including the private sector. Representing the collective views of Brent’s Voluntary Sector. Campaigning on leading issues to effect local policy change on behalf of the VCS. To provide a platform for local VCS organisations in being represented on key strategic boards and to communicate board discussions to the wider VCS. To train local VCS organisations in effecting social change (inc. use of advocacy, research and evaluation skills). To increase the visibility of the local VCS as a key service provider for local statutory bodies, particularly with developing commissioning intentions in preparation of the delivery of public services. More local VCS organisations are represented on key strategic boards and can communicate board discussions to the wider VCS. More local VCS organisations can effect social change through the use of enhanced advocacy, research and evaluation skills. More local VCS are increasingly recognised as key service providers for local statutory bodies, particularly with developing commissioning intentions in preparation of the delivery of public services.